Communication for the satellite is on VHF (137MHz for TM and 149MHz for TC). There are two payload transponders – Indian and Dutch. Dutch transponder was delivered by William Leijenaar, PE1RAH. Both these operate in Mode-B with 435.25MHz uplink and 145.90MHz downlink. Indian transponder is identified by an un-modulated carrier on 145.936MHz and Dutch transponder has a CW signal on 145.860MHz. The output power is about 30dBm. Bandwidth is 60KHz for the Indian transponder and 50KHz for the Dutch transponder. Only one transponder is `on’ at a time. Antennae are turnstile are common for TM/TC and payload transponders. A Second Transponder developed by Mr. William Gerard Leijenaar, Dutch Amateur Radio Operator and a Graduate Engineering student at Higher Technical Institute, Venlo, Netherlands. CW, SSB, FM Modes of Communciation. 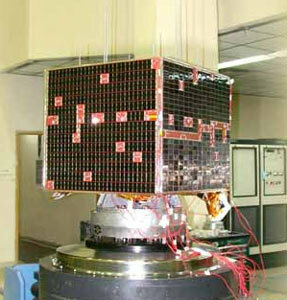 Programmed tracking of Hamsat is being carried out by ISRO’s two stations at Bangalore and Lucknow.